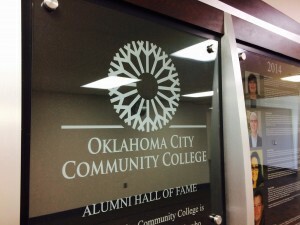 President Paul Sechrist and Alumni Relations Director Randy Cassimus unveiled OCCC’s new Alumni Hall of Fame Wall of Honor June 4 in the administrative connector between the president’s office and the Academic Affairs office. The display features the names of previous inductees and photos of the most recently honored alumni. “We just thought it would be a great way to permanently memorialize and pay tribute to our great alumni who are out in the world telling the world that this is a great institution,” Sechrist said. Mary Brese, 2012 Alumni Hall of Fame inductee and currently a mathematics teacher, was eager to see the wall of honor. Brese received her associate degree in math at OCCC and is ending her first year as a member on the alumni board. She praised the college for helping students prepare for their careers. City Rescue Mission CEO and President Tom Jones, also a 2012 Alumni Hall of Fame inductee, said OCCC’s professors stand out because of their investment in their students. “I think that the staff in connecting with their students — which is different than many major universities — encouraged me to stick with it,” he said. Cassimus said the OCCC Association of Alumni and Friends is accepting nominations now through Aug. 28 for alumni to be considered for into the 2015 Alumni Hall of Fame. He said nominees are considered based on their professional or community achievements as well as the impact they have made on OCCC. To submit a nomination, visit www.occc.edu/foundation/alumni. For more information, contact Cassimus at 405-682-1611, ext.7478, or at rcassimus@occc.edu.